Image © DC Comics. Written by Simon Spurrier, art by Bilquis Evely, colors by Mat Lopes, letters by Simon Bowland. Lucien the librarian is struggling to fill the void of authority left by the absence of Dream, and has allowed an old Nightmare to be released, Judge Ezekiel Gallows. He was created by Dream as a horror of the old west. Gallows suggests he would be happy to advise Lucien on the many problems he sees plaguing The Dreaming, and Lucien is willing to let him while he has a rest. Before long, the equally long imprisoned characters Brute and Glob are enlisted by Judge Gallows to help set things right, in a quest for justice and punishment, as he sees it. The inhabitants of The Dreaming watch nervously as Gallows confronts Dora, wondering if they will be the next target. I’m really enjoying Simon Spurrier’s prose and dialogue in this third issue. I think he’s loosened up a bit and is making the series his own, and I like what he’s bringing. The art by Evely is quite excellent too, and also perhaps taking on a more personal vision of the characters, which works fine for me. 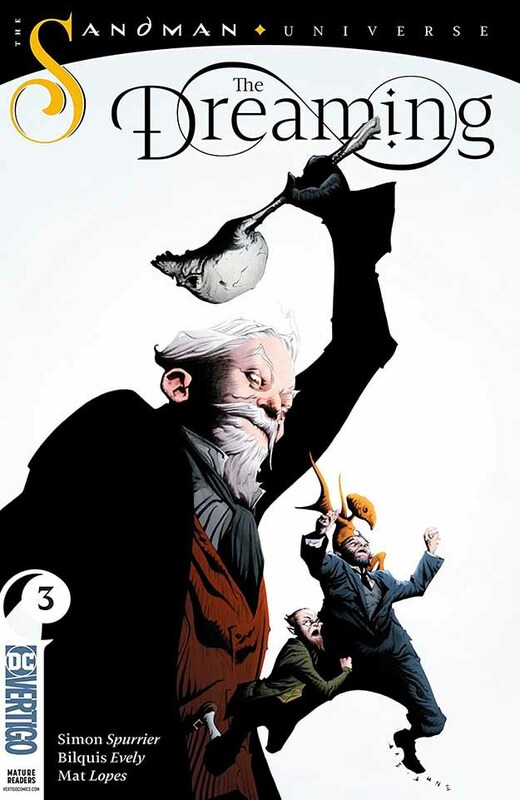 This entry was posted in Comics, Reviews on December 4, 2018 by Todd.